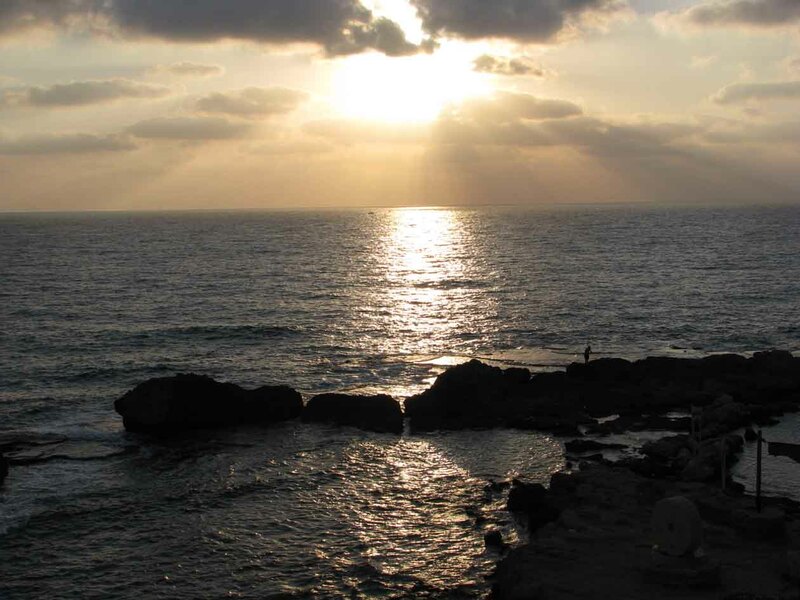 We have a weekend home in the sweetest little town in Israel – Nahariya. This small, northern town caresses the Mediterranean at a particularly picturesque location, and from our balcony we can watch the sailboats skimming along the placid sea. In the early morning, we see the fishing boats go out, a spotter aloft in the prow scanning the azure waters for fishy schools below, and in the evening we take drinks on that balcony (verbena tea for me) and watch the sun lower itself from a swirly pink sky and sizzle out into the sea. And then the dog has her last outing for the day, and we settle down to dinner and a good movie on TV. It could be bliss. It’s hard work transforming international public opinion after the Israeli bombardment of Gaza one year ago, which played out so poorly in the Goldstone Report and European capitals. But in Israel, there’s no need to shift public opinion at all, after that very popular war. “What blockade? There’s no blockade of Gaza,” said my cousins in Jerusalem, who are as well informed as most Israelis. If you place a million people under siege and the local media are not there to cover it, does the siege exist? And does protest exist, when the police crack down on peaceful demonstrators exercising their right to disagree with state policies? Over 700 protesters were arrested during the Gaza War for trying to make anti-war statements. Nonviolent demonstrators who march every Friday in Palestinian villages where the Separation Barrier is being erected have experienced live fire, stun grenades, tear gas, and new forms of crowd control – the “skunk guns” that smelled so bad even the police were forced to stop using them. These methods have already caused deaths and injuries. Ongoing protests in East Jerusalem against the eviction of Palestinians from their homes to make room for settlers have met with more arrests and brutality. Last week, to the misfortune of the police, they also arrested the director of the Association for Civil Rights in Israel, a bad way to improve relations with civil society. So is it all about image? Inside Israel, it’s about no image. Israeli media carried no reporting whatsoever from inside Gaza during the bombardment, and it was considered subversive during the fighting to listen to reports from CNN, the BBC or, God forbid, al-Jazeera. It is still forbidden for Israeli journalists to enter Gaza and report how families are bearing up in homes with gaping holes in their roofs because Israel does not allow construction materials to be brought in. Now if the Gazans only lived in Haiti… As for the West Bank, why should the journalists bother? Brutality by the army is not new and hence not newsworthy. To catch anybody’s attention, human rights organizations like B’Tselem have to resort to teaser headlines, smart animations, and videos of Gaza rappers (see http://www.btselem.org/English/ - full disclosure, I’m affiliated). So here’s what grabbed the headlines in Israel all week: Sarah Netanyahu, the prime minister’s wife, was accused of underpaying and overworking the cleaning lady. If you’re out and about in Israel, you better have a clear opinion about this: Is it true, or just a plot to undermine the peace plan that our Prime Minister is eager to launch? Here’s a hint: Riding by our demonstration for economic justice several years ago, Sarah Netanyahu got out of her chauffeur-driven car to share her views with us: “If I get along on minimum wage,” said Sarah, “anyone can.” One hardly knows where to begin. There is a country full of people on this beautiful Saturday afternoon watching the sailboats skim by, driving out to catch the fields full of red poppies after the heavy winter rains, or walking their dogs through daffodils. But they won’t be crossing the Separation Barrier anytime soon to witness the horrors on the other side, and the news on TV in the evening won’t bring that horror into their homes. “What occupation?” is now the most common reaction of passersby to our Women in Black vigil in Jerusalem. For the young, it’s an honest question; for the older, it’s a smirk and walk on.